(Church calendar - Apr 1) Movable feast - on the 5th Sunday of the Great Lent. Abba Zosimas immediately left the monastery, and following the angel, he went to the Jordan monastery and settled in it. Here he met Elders who were adept in contemplation, and also in their struggles. Never did anyone utter an idle word. Instead, they sang constantly, and prayed all night long. Abba Zosimas began to imitate the spiritual activity of the holy monks. Thus much time passed, and the holy Forty Day Fast approached. There was a certain custom at the monastery, which was why God had led Saint Zosimas there. On the First Sunday of Great Lent the igumen served the Divine Liturgy, everyone received the All-Pure Body and Blood of Christ. Afterwards, they went to the trapeza for a small repast, and then assembled once more in church. The monks prayed and made prostrations, asking forgiveness one of another. Then they made a prostration before the igumen and asked his blessing for the struggle that lay before them. During the Psalm “The Lord is my Light and my Savior, whom shall I fear? The Lord is defender of my life, of whom shall I be afraid?” (Ps 26/27:1), they opened the monastery gate and went off into the wilderness. Each took with him as much food as he needed, and went into the desert. When their food ran out, they ate roots and desert plants. The monks crossed the Jordan and scattered in various directions, so that no one might see how another fasted or how they spent their time. The monks returned to the monastery on Palm Sunday, each having his own conscience as a witness of his ascetic struggles. It was a rule of the monastery that no one asked how anyone else had toiled in the desert. Abba Zosimas, according to the custom of the monastery, went deep into the desert hoping to find someone living there who could benefit him. He walked into the wilderness for twenty days and then, when he sang the Psalms of the Sixth Hour and made the usual prayers. Suddenly, to the right of the hill where he stood, he saw a human form. He was afraid, thinking that it might be a demonic apparition. Then he guarded himself with the Sign of the Cross, which removed his fear. He turned to the right and saw a form walking southward. The body was black from the blazing sunlight, and the faded short hair was white like a sheep’s fleece. Abba Zosimas rejoiced, since he had not seen any living thing for many days. Then Abba Zosimas was terrified, realizing that she could not have called him by name unless she possessed spiritual insight. The holy ascetic replied, “You, Abba Zosimas, as a priest, ought to pray for me and for all, for you are called to do this. However, since we must be obedient, I will do as you ask. She replied, “It distresses me, Father, to speak to you about my shameless life. When you hear my story, you might flee from me, as if from a poisonous snake. But I shall tell you everything, Father, concealing nothing. However, I exhort you, cease not to pray for me a sinner, that I may find mercy on the Day of Judgment. “I was born in Egypt and when I was twelve years old, I left my parents and went to Alexandria. There I lost my chastity and gave myself to unrestrained and insatiable sensuality. For more than seventeen years I lived like that and I did it all for free. Do not think that I refused the money because I was rich. I lived in poverty and worked at spinning flax. To me, life consisted in the satisfaction of my fleshly lust. “One summer I saw a crowd of people from Libya and Egypt heading toward the sea. They were on their way to Jerusalem for the Feast of the Exaltation of the Holy Cross. I also wanted to sail with them. Since I had no food or money, I offered my body in payment for my passage. And so I embarked on the ship. “Now, Father, believe me, I am very amazed, that the sea tolerated my wantonness and fornication, that the earth did not open up its mouth and take me down alive into hell, because I had ensnared so many souls. I think that God was seeking my repentance. He did not desire the death of a sinner, but awaited my conversion. “So I arrived in Jerusalem and spent all the days before the Feast living the same sort of life, and maybe even worse. “When the holy Feast of the Exaltation of the Venerable Cross of the Lord arrived, I went about as before, looking for young men. At daybreak I saw that everyone was heading to the church, so I went along with the rest. When the hour of the Holy Elevation drew nigh, I was trying to enter into the church with all the people. With great effort I came almost to the doors, and attempted to squeeze inside. Although I stepped up to the threshold, it was as though some force held me back, preventing me from entering. I was brushed aside by the crowd, and found myself standing alone on the porch. I thought that perhaps this happened because of my womanly weakness. I worked my way into the crowd, and again I attempted to elbow people aside. However hard I tried, I could not enter. Just as my feet touched the church threshold, I was stopped. Others entered the church without difficulty, while I alone was not allowed in. This happened three or four times. Finally my strength was exhausted. I went off and stood in a corner of the church portico. “After I had spoken, I felt confidence in the compassion of the Mother of God, and left the spot where I had been praying. I joined those entering the church, and no one pushed me back or prevented me from entering. I went on in fear and trembling, and entered the holy place. “Then I left the church portico and started on my journey. A certain man gave me three coins as I was leaving the church. With them I bought three loaves of bread, and asked the bread merchant the way to the Jordan. “Believe me, Abba Zosimas,” the woman said, “I spent seventeen years in this wilderness (after she had spent seventeen years in immorality), fighting wild beasts: mad desires and passions. When I began to eat bread, I thought of the meat and fish which I had in abundance in Egypt. I also missed the wine that I loved so much when I was in the world, while here I did not even have water. I suffered from thirst and hunger. I also had a mad desire for lewd songs. I seemed to hear them, disturbing my heart and my hearing. Weeping and striking myself on the breast, I remembered the vow I had made. At last I beheld a radiant Light shining on me from everywhere. After a violent tempest, a lasting calm ensued. “Abba, how shall I tell you of the thoughts that urged me on to fornication? A fire seemed to burn within me, awakening in me the desire for embraces. Then I would throw myself to the ground and water it with my tears. I seemed to see the Most Holy Virgin before me, and She seemed to threaten me for not keeping my vow. I lay face downward day and night upon the ground, and would not get up until that blessed Light encircled me, dispelling the evil thoughts that troubled me. She smiled at hearing this question, and answered, “Believe me, I have seen no human face but yours from the time that I crossed over the Jordan. I never learned from books. I have never heard anyone read or sing from them. Perhaps the Word of God, which is alive and acting, teaches man knowledge by itself (Col 3:16, 1 Thess 2:13). This is the end of my story. As I asked when I began, I beg you for the sake of the Incarnate Word of God, holy Abba, pray for me, a sinner. Again Abba Zosimas was amazed, that the practice of his monastery was known to the holy woman ascetic, although he had not said anything to her about this. Asking for his prayers, the woman turned and vanished into the depths of the desert. For a whole year Elder Zosimas remained silent, not daring to reveal to anyone what he had seen, and he prayed that the Lord would grant him to see the holy ascetic once more. When the first week of Great Lent came again, Saint Zosimas was obliged to remain at the monastery because of sickness. Then he remembered the woman’s prophetic words that he would not be able to leave the monastery. After several days went by, Saint Zosimas was healed of his infirmity, but he remained at the monastery until Holy Week. On Holy Thursday, Abba Zosimas did what he had been ordered to do. He placed some of the Body and Blood of Christ into a chalice, and some food in a small basket. Then he left the monastery and went to the Jordan and waited for the ascetic. The saint seemed tardy, and Abba Zosimas prayed that God would permit him to see the holy woman. Again she made the Sign of the Cross over the Jordan, and walked over the water as before, and disappeared into the desert. Zosimas returned to the monastery with joy and terror, reproaching himself because he had not asked the saint’s name. He hoped to do so the following year. Reading this note, Abba Zosimas was glad to learn her name. He then realized that Saint Mary, after receiving the Holy Mysteries from his hand, was transported instantaneously to the place where she died, though it had taken him twenty days to travel that distance. Glorifying God, Abba Zosimas said to himself, “It is time to do what she asks. But how can I dig a grave, with nothing in my hands?” Then he saw a small piece of wood left by some traveler. He picked it up and began to dig. The ground was hard and dry, and he could not dig it. Looking up, Abba Zosimas saw an enormous lion standing by the saint’s body and licking her feet. Fear gripped the Elder, but he guarded himself with the Sign of the Cross, believing that he would remain unharmed through the prayers of the holy woman ascetic. Then the lion came close to the Elder, showing its friendliness with every movement. Abba Zosimas commanded the lion to dig the grave, in order to bury Saint Mary’s body. At his words, the lion dug a hole deep enough to bury the body. Then each went his own way. The lion went into the desert, and Abba Zosimas returned to the monastery, blessing and praising Christ our God. Arriving at the monastery, Abba Zosimas related to the monks and the igumen, what he had seen and heard from Saint Mary. All were astonished, hearing about the miracles of God. They always remembered Saint Mary with faith and love on the day of her repose. Abba John, the igumen of the monastery, heeded the words of Saint Mary, and with the help of God corrected the things that were wrong at the monastery. Abba Zosimas lived a God-pleasing life at the monastery, reaching nearly a hundred years of age. There he finished his temporal life, and passed into life eternal. 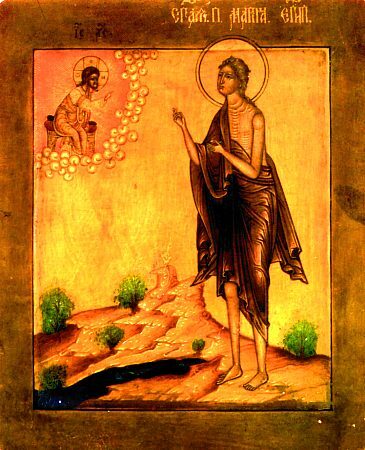 The monks passed on the life of Saint Mary of Egypt by word of mouth without writing it down. The image of God was truly preserved in you, O mother, / For you took up the Cross and followed Christ. / By so doing, you taught us to disregard the flesh, for it passes away; / But to care instead for the soul, since it is immortal. / Therefore your spirit, O holy Mother Mary, rejoices with the Angels. Having been a sinful woman, / You became through repentance a Bride of Christ. / Having attained angelic life, / You defeated demons with the weapon of the Cross; / Therefore, O most glorious Mary you are a Bride of the Kingdom!